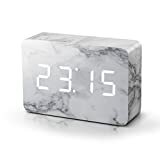 Time can be smart, clever, ultra-stylish, functional and simple with this brick marble alarm clock. Display time, date and temperature alternately. LED display automatically switches off when it’s quiet. 12/24 hours and Celsius or Fahrenheit format display can be selected. European or American date format can be selected. Battery life after fully charged : 5-7 days in permanent display and 2-3 months in sound activated display. In-built internal memory battery to keep all your custom settings.